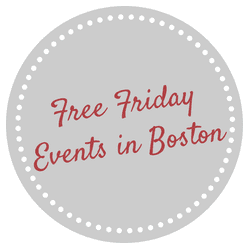 Free Friday Events in Boston for July 27, 2018! There’s so many fun things happening on Friday this summer from Highland Street Foundation’s Free Fun Fridays to free outdoor movies. This post rounds up all the fun and free events on Fridays this summer! Patriots Training Camp (Foxboro, MA): Head to Gillette Stadium to watch the Pats train for the 2018-2019 season! Practice starts at 9:15am, gates open at 8AM. Fenway Fridays: Enjoy this weekly block party with fun promotions, live music, and more in the Fenway every Friday! Boston Children’s Museum: Head to the Boston Children’s Museum on Friday nights from 5-9pm for $1 admission! Please let me know if I missed any free and fun things happening this Friday in Boston. Don’t forget to check back tomorrow to find some more free fun happening this weekend in the city!